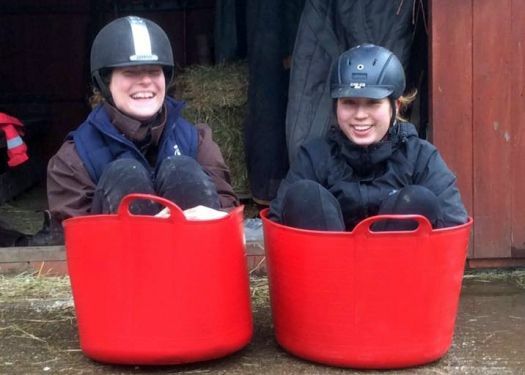 Starting at the age of five with riding lessons and Pony Club membership you can work towards certificates recognised by a national organisation, the Association of British Riding Schools (ABRS). We hold regular training days and tests for the Equitation and Stable Management ‘A to E’ awards. Aged 13–25 years? Spend one day each week for eight weeks volunteering on the yard to obtain your YELA Bronze Certificate. Essential if you want to work in sports leadership or with children, and a great addition to your CV. already hold the ABRS ‘C’ test. Helpers will be supervised to keep a log book designed to develop competence in assisting before, during and after lessons and a growing awareness of Health and Safety around the yard. There are three levels leading to the ABRS Equestrian Care Awards. Older helpers (14yrs+) can train for the Riding School Assistant Certificate of Competence issued by the British Horse Society (BHS). Willow Farm has achieved the prestigious BHS Clubmark accreditation and receives funding for BHS training. Again any candidates must be current pupils and hold ABRS E Test or ABRRS Level 1 to be accepted onto this training scheme. Willow Farm is part of the National Apprenticeship scheme. If you have left school and you are considering a career as a Yard Manager or Riding Instructor then this would be a good place to start. Training Provider is KEITS (Keeping Excellence in Training Standards) – and we currently have a vacancy for a new apprentice! Ring 01754 830316 or contact us on Facebook for more information.